A new convergence of IT infrastructure is forcing rapid change in the digital world. With networks getting faster and the whole world going mobile, the number of digital connections is growing at an unprecedented rate. In response, government IT must become more agile, or be left behind. But how can your organization gain, and more importantly, maintain, an advantage at such speeds? 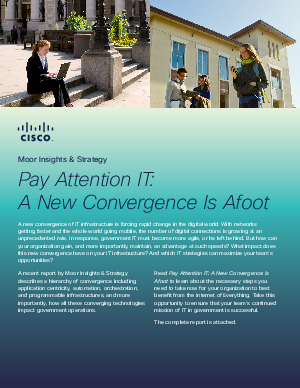 What impact does this new convergence have on your IT infrastructure? And which IT strategies can maximize your team’s opportunities?